On Sale! 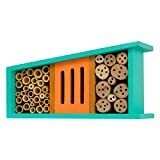 Up to 10% off on Butterflies at Go Plots. Top brands include Esschert Design, Heartwood, Stovall Products, Little Thoughtful Gardener, Woodlink, Wildlife World Ltd, Tierra Garden, Esschert Design USA, Songbird Essentials, & Happybuy. Hurry! Limited time offers. Offers valid only while supplies last.